The name Aeginion is witnessed on an inscription found in the eastern part of Saint John the Baptist Church. In the beginning of the 10th century (901-907) present Kalampaka is mentioned as Stagoi, a name still in existence as a Metropolitan title. The city was liberated from Turkish Possession on the 27th August 1881. 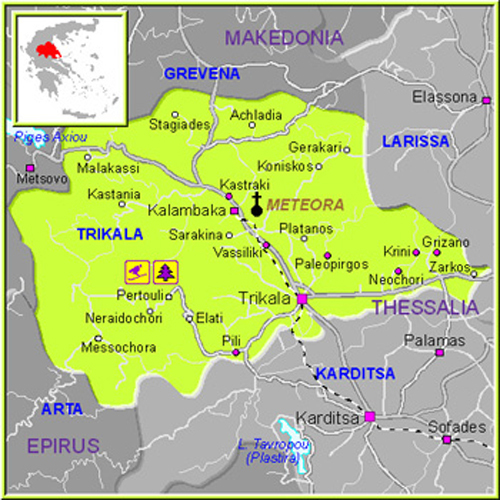 During the Macedonian Struggle, the city was a starting point for Greek fighters. According to the theory of the German geologist Philipson, who visited Greece at the end of the 19thcentury, the creation of these huge stones is due to a delta-shaped cone of river rocks and lime stone which for millions of years poured into the sea covering Thessaly at the time. 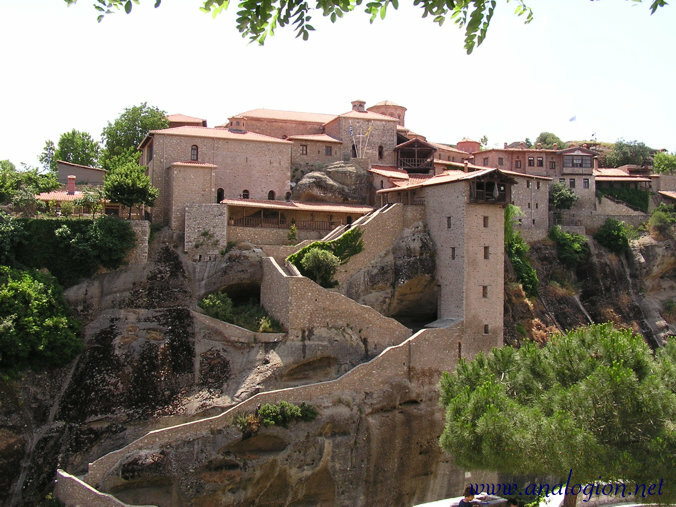 Meteora is, second to Agion Oros, the largest and most consistently present monastery unity in Greece since the time of the first monks settling there. 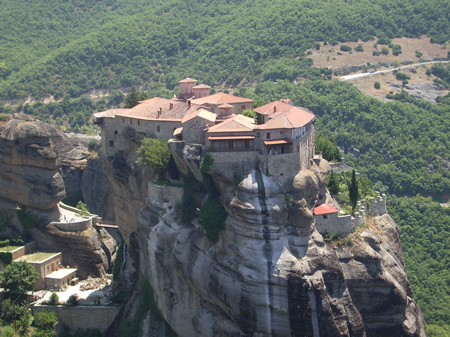 Out of historic witnesses, we can gather that the Meteora monasteries were thirty in total. Only six of them are open till present time and they accept crowds of pilgrims. However, there are many abandoned smaller monasteries most of which had been built in the 14th century. 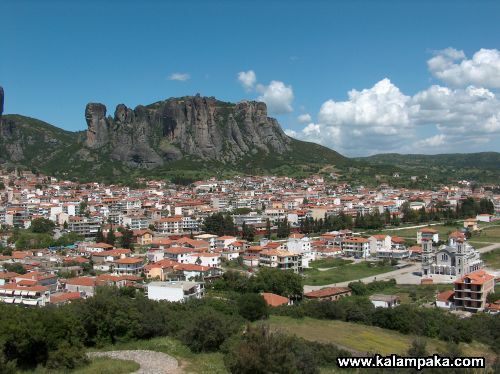 The name Meteora is more modern and is not mentioned by ancient writers. They owe their name to Saint Athanasios the Meteorite, owner of the Jesus Christ Metamorphosis monastery (Big Meteoro), who named so “the wide rock”, on which he climbed in 1344 for the first time. During Turkish possession in Thessaly (1393-1881), Meteora’s monasteries functioned as places of hope. In the beginning of the 19th century, the troops of Ali Pasha inflicted destructions and loots in many of them. The six visitable monasteries have been restored and conserved the greatest part of their mural decoration. In 1989, the United Nations enrolled Meteora in the List Universal Heritage as a site of special cultural and natural importance. The monasteries contain Byzantine and historic exhibits. A. Castle in Trikala city. In Kalampaka, you will find traditional taverns in which you could enjoy local meat such as pork and lamb kebab, as well as river fish from the rivers around, local wine and tsipouro. Other traditional products are trachanas and chylopites (noodles). 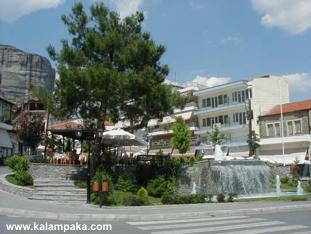 Only 15 minutes from Kalampaka is Trikala featuring the river crossing the city. Elati and Pertouli are close villages too where friends of ski could enjoy the snow-skating center during winter months. Acheloos River is ideal for canoe and kayak while a little outside Elati, we can find the climbing field of Kokkinos Vrachos (Red Rock).